We just wrapped up another very successful Mystery Chocolate Box and we’re ready to share it with you. Let’s see what February 2017’s box is all about. Reason #1: The inclusion wasn’t a very strong flavor, although you could definitely taste something that told you that it wasn’t a plain dark chocolate bar. Reason #2: The inclusion was kind of a blend between an “alternative sweetener” and a real inclusion. We’ll call it a “pseudo-inclusion”. However, it’s listed on the front of the box as the flavor of the bar, so that’s good enough for us. The first thing we’d like to point out about this bar is that it’s free of many, many things (see the top of the wrapper). If you could see the back of the original wrapper, they have even more things listed that are not to be found in this bar. We’re just glad they didn’t forget to include the chocolate in their haste to be free of everything! Anyway, to be completely honest, this was a bar that grew on us. The flavor of the lucuma does make a difference when compared to a regular chocolate bar. However, we liked how it wasn’t overly sweet, but it wasn’t too bitter as well. Those of you with more astute senses of smell might have been able to guess one of these inclusions from the scent of the bar alone! Then, when you bit into it, this bar had a great clean taste, finished by a bit of spice. What was that nice clean taste, and the hint of spice? The round and luscious taste of pear and cinnamon offer an interesting taste experience. And all we would like to politely ask is…what exactly does “round” taste like? We’d love to know. Anyway, this was a delightful bar and we quite enjoyed it. Now, let’s get to the final bar of the box! There’s one major reason we included this bar. And it’s NOT because this is a hard inclusion to guess (in fact, it’s rather obvious, so we really hope you got this one right). No, the reason we included this bar is because it was ridiculously delicious. So good in fact that it was worth the “freebie” guess just because we wanted everyone to be able to enjoy this bar. We think this bar tasted like a Milky Way…but way higher quality! And therefore twice as tasty — so when we first tried this bar, we knew we had to include it. 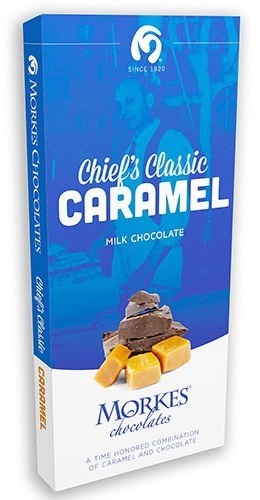 We’re pretty sure the only reason anyone might not have liked this bar is if they don’t like caramel. If that’s you, sorry about that. Anyway, that’s your February 2017 Mystery Chocolate Box! No Replies to "February 2017"